Registered brokers bring risks to the underwriters in the Lloyd’s market on behalf of clients, using their specialist knowledge to locate the best underwriters and negotiate competitive terms and conditions. Find a list of Lloyd’s Brussels registered brokers here or use the Lloyd’s Market Directory to find an alphabetical listing of the organisations that operate within the Lloyd’s market. Lloyd’s Brussels has a network of service companies across Europe, providing specialist underwriting expertise to their local markets. Contact your nearest European branch to find a service company in your country or use the Lloyd’s Market Directory to find specific organisations that are licensed to write non-life risks across the European Economic Area. There are additional underwriting agencies (known as coverholders) across Europe issuing policies on behalf of Lloyd’s Brussels direct to brokers and clients. Contact your nearest Lloyd’s European branch to find a coverholder in your country or find further details through the Lloyd’s Market Directory. Our policies are backed by the same excellent financial ratings as Lloyd’s, so you can be sure placing risks with Lloyd’s Brussels is safe and secure. Lloyd’s Brussels also benefits from Lloyd’s central resources, including the Lloyd’s Central Fund. 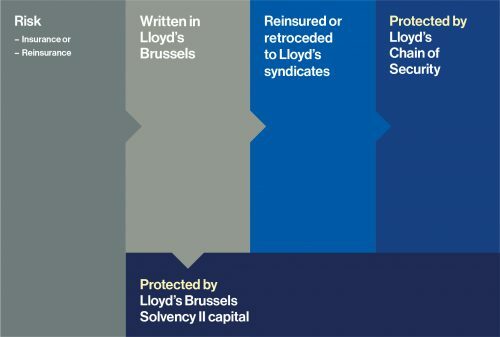 As all Lloyd’s Brussels policies are 100% reinsured back to Lloyd’s syndicates, they are ultimately backed by Lloyd’s unique capital structure, often referred to as the Chain of Security. Both insurance and reinsurance policies placed with Lloyd‘s Brussels benefit from the stability of the Lloyd’s Chain of Security. In addition, Lloyd’s Brussels holds its own Solvency II capital for further protection. Lloyd’s Brussels does not write US risk. For insurance premium, including US premium, paid to Lloyd’s syndicates, the single Lloyd’s market W-8 IMY will be sufficient for FATCA purposes. Further detail is available on the Lloyd’s FATCA pages.